Love Your Melon, which sustains itself by selling a hat for each one it donates, toured the East Coast in January and was featured on “The Today Show.” During the 25-day trip, they delivered 2,500 hats. Monica Fisher-Somerlott’s eyes opened wide Monday when Superman, Captain America and two new superheroes – Love Your Melon men – popped into her hospital room. “This doesn’t happen every day,” said the 15-year-old, sitting up in bed to shake Superman’s hand. The costumed college students came bearing bins full of knitted hats for sick children at Providence Sacred Heart Children’s Hospital. The traveling nonprofit, Love Your Melon, was formed through an entrepreneurship class at the University of St. Thomas in Minnesota. The group is on a 45-day West Coast tour that ends on June 30. “What color hat do you want?” Justin Strom asked. Monica chose green, the most popular color of the American-made hats, and tried it on for size. The college students who created the nonprofit not only wanted to help children in cancer treatment keep warm, but also give them more confidence after chemotherapy steals their hair. The superhero costumes make the introductions easier. The idea came from “us thinking about our own childhoods and what we liked,” said Sam Harper, a Love Your Melon board member. The outfits bring a smile to the kids’ faces, too. After Spokane, the tour continues to several other cities including, Seattle, San Francisco and Las Vegas. “We hope to give away 2,500 more on this tour,” Harper said. 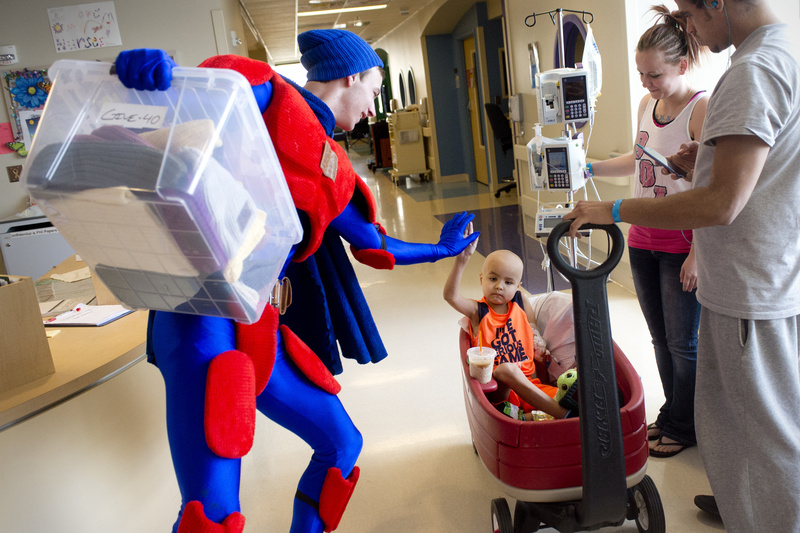 The group kicked off superhero week at the children’s hospital, a hospital spokeswoman said. Batman and Spider-Man are expected to swing in this week. The superheroes will be dangling from strings outside children’s rooms.